We reviewed the City Council Agenda documents released to the public that Thursday, 8/9/18. Here is a direct link to the Comprehensive Land Use Plan Agenda Report, where we sourced our information. Why would they want something copied from the ‘Comprehensive Plan Agenda Report’ retracted? In addition, we reached out to the City Clerk & Director of Community Development, regarding if there were any errors or corrections in the report. As of 8/16/18, they were not aware of any. City Council made a few changes to the Comprehensive Land Use Plan draft version. They added the following language on page 35. The goals, objectives, and strategies outlined in this Vision Chapter will require the majority of Council to support and move forward functionally and financially. 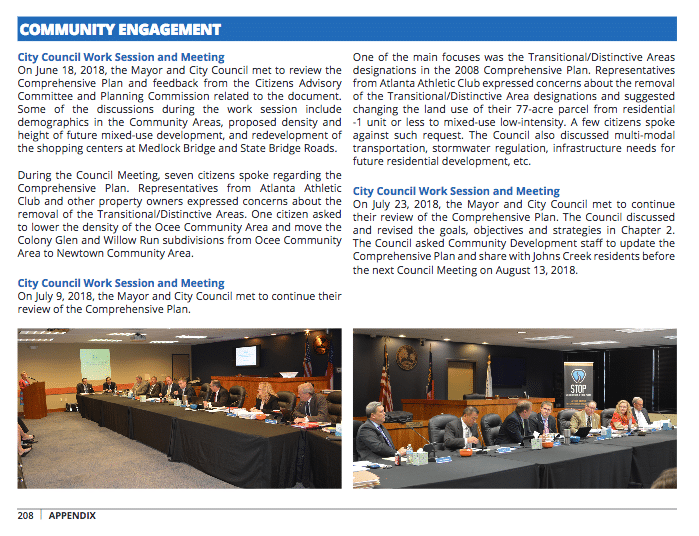 City Council did not change the Atlanta Athletic Club (Heisman Field) density of AG-1 (Agriculture: 1 Unit per Acre), despite, AAC recommendation (See above document). They will need to follow the Rezoning process if they want to pursue Mixed-Use or any other land use changes for the City Council to consider. It is expected that undeveloped/underdeveloped parcels will be developed with a similar density or use as the surrounding neighborhood(s) or development(s). Remaining mindful of the diverse property uses surrounding these parcels, undeveloped/underdeveloped properties should be considered for rezoning. Finally, City Council Voted to send the Comprehensive Plan to the Atlanta Regional Commission and the State of Georgia Department of Community Affairs for Review. It is expected back in 30 days. Furthermore, on page 208 of the Comprehensive Land Use Plan, discusses the July 9th, 2018 City Council meeting comments. Wow ? AAC members should ashamed of this legal representation. No more traffic or development. Why in the world is legal council for AAC not telling the truth about this matter?